What if I told you that you could become a profitable trader from trading no more than just one trading strategy? You’d probably feel pretty surprised, right? Some of you may even feel outright offended! But let me let you into as small secret. 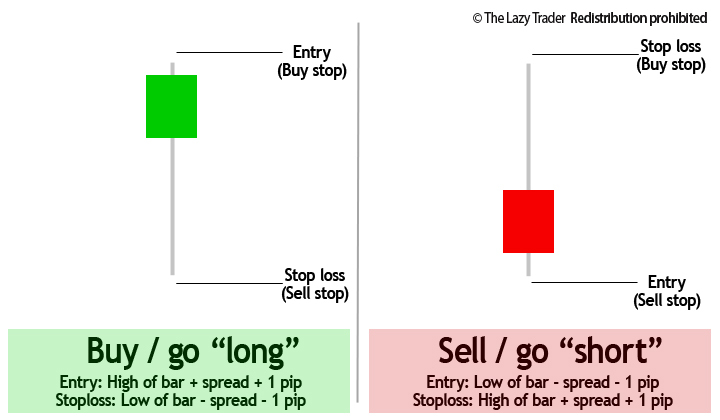 Trading just one price action based pattern represents the majority of the trades we take today…and this price action pattern is the pin bar. Surprised? You shouldn’t be! After all, it’s better to be the master of one trading strategy than the jack of all…now I’m pretty sure you’ve heard that before! 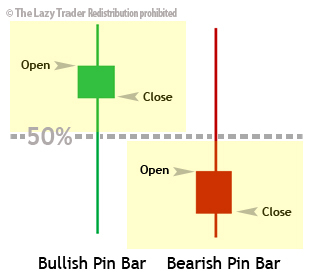 Trading the pin bar alone holds many key advantages for us Lazy Traders. It’s a price pattern that’s celebrated as one of the most popular price action based patterns both to trade and to teach. Not only can we use the pin bar as an efficient entry or “launch pad” to taking highly profitable, long-term swings in the market, they also act as highly reliable indicators in telling us where the market is likely to head next. They have been and will always be a firm family favourite with Lazy Traders. But what are they, when do we trade them and how? I’m glad you asked. What is the pin bar? Whether you know them low test bar or a shooting star, the chances are you’ve probably already come across the pin bar, perhaps without even realising it. Regardless of what you know pin bars to be, the good news is that they tell us the exact same thing and we can trade them in the exact same way, no problem! 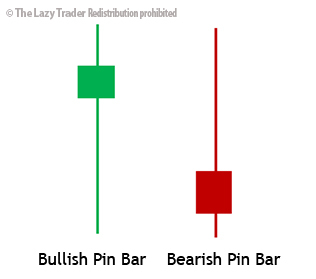 A pin bar is a price action pattern which you can see on any timeframe which tells us that a certain price or technical level has been sharply rejected. If this is the case, then they can give us a reliable heads up with what happens next. If we have a bearish pin bar reversal as a technical level, then we have probabilities stacked in our favour that price is likely to fall. If we have a bullish pin bar reversal at a technical level, then we have a indication that price is likely to head upwards next. Pin bars are best viewed as in Japanese candlestick form on the chart, although you can also see them lucidly using OHCL (Open high low close) charts too. They are characterised as having a long “tail”, also known as the “wick” with the open and close, known as the “body”, in the upper or lower half of the bar. If the open and close of the bar is in the top half/50% (ideally the upper third of the bar) then we have a bullish pin bar reversal. Conversely, if the open and close is in the lower half/50% (ideally the lower third of the bar) then we have a bearish pin bar reversal. It doesn’t matter what the colour of the bar is. 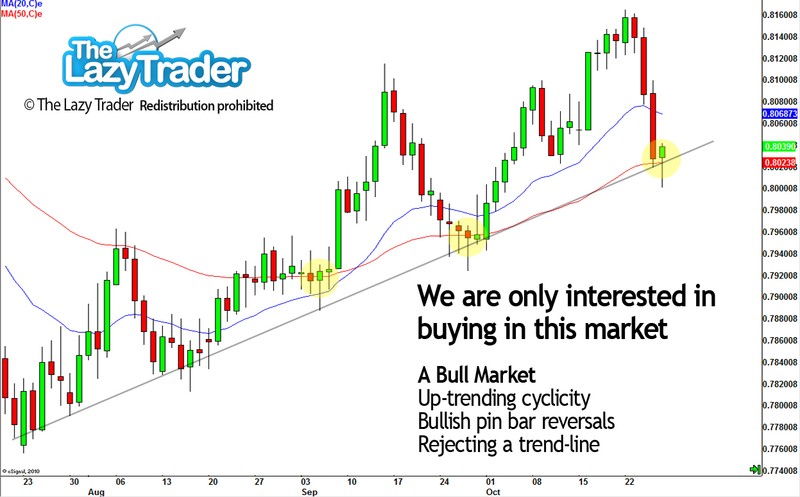 If you have a bullish pin bar reversal as a seller (red) bar, then it is still bullish as a price pattern. Conversely, if you have a bearish pin bar reversal which is a buyer bar (green), then it is still a bearish price pattern. That said, generally bullish pin bars are green buyer bars and bearish pin bars, red seller bars. When it comes to trading pin bars, a pin bar on its own is simply not enough. We are only interested in actually trading pin bar reversals which are rejecting a meaningful technical level. This is because pin bar reversals by their very nature reflect a sharp rejection in price with the tail/wick visually representing this on the chart for us. Fortunately for us, the versatility of the pin bar pattern means we can trade in both trending and range-bound markets. But we do want to be on the right side of the market, regardless of what market we are in! As technical traders, trading probabilities based on what we see on the chart, we want to make sure we have as many proabilities on side as possible. Having the market on our side helps. In fact, it helps a lot! 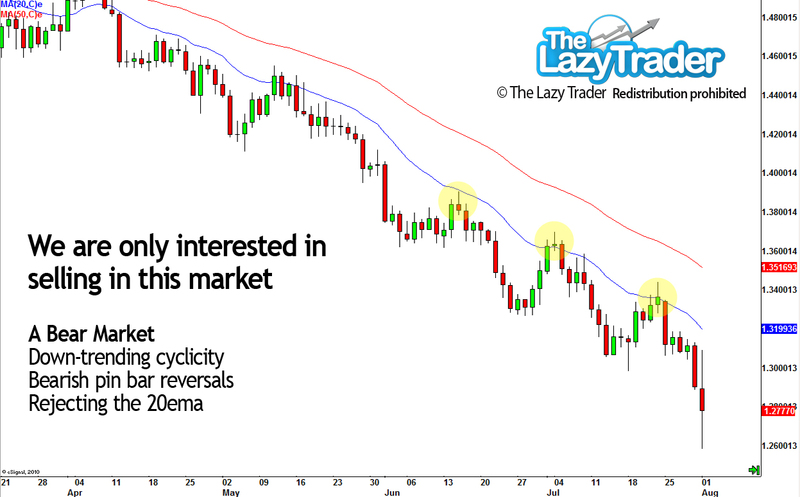 All we have to do is trade with the trend by buying in an up-trend or selling in a down-trend. Does it get more complex than that? Not really… If the market is range-bound then we can simply sell at the top of the range and buy the bottom. The pin bar serves as our confirmation or “activator bar”. It will be our entry into the trade. We will trade the bullish pin bar if the context of the market is bullish (ie: in an uptrend or buying the bottom of the range) and the bearish pin bar reversal if the context of the market is bearish (ie: in a down-trend or selling at the top of a range)…but only if we have a technical level(s) supporting the direction. In the example above (GBPCAD daily chart) you will see that our technical arguement for the sell at the top of the range followered by the buy at the bottom is governed by the key levels obstructing price from going any further. The pin bar gives us the confirmation that price where price is likely to go thereafter. A bullish pin bar = price likely to go up. A bearish pinbar = price is likely to go down. As you can probably imagine, there are pin bars and there are pin bars. 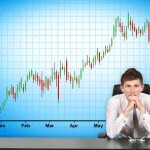 As traders running our trading account as a business, we should only select the best. We owe it to our bottom line. 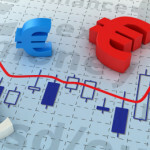 Now, we’ve talked about trading only with the trend and having as many technical reasons on our side as possible. But what if we could take it one step further to really eliminate some of the gunk? Well, we can! The best pin bars are the ones where their tail is bouncing off and rejecting a price where no other preceeding bars have reached after a pullback. Not only does this reflect a sharp and decisive rejection and that price wants to continue with the over all trend, it lets us place our stop loss in a far safer place and minimise the chances of being stopped out for a loss. 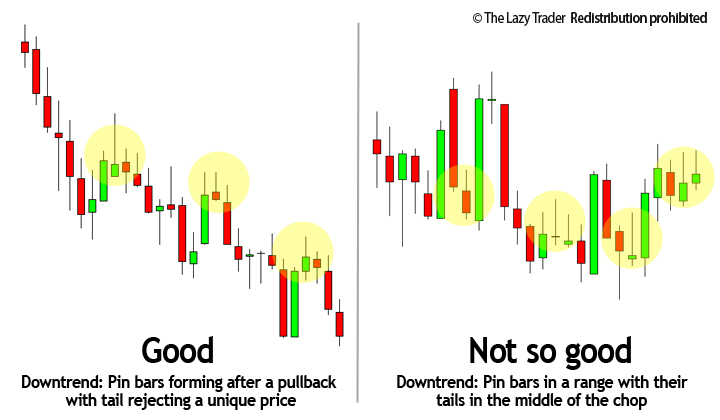 The example above on the left reflects the best kind of pin bar, with its tail rejecting an independent price after a pullback. We love these! However, although the example on the right has pin bars – they are in a choppy range and it is more likely that we will get stopped out as the tail is not rejecting an independent price. 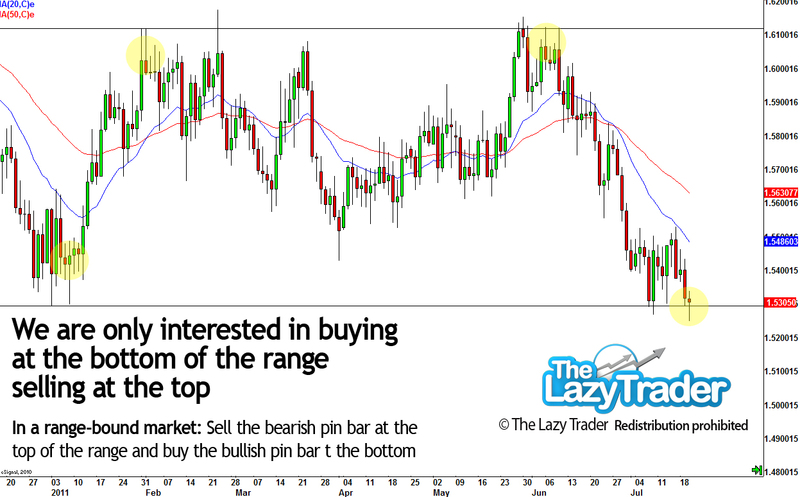 Pin bars are highly versatile and can be profitably traded both in trending and range-bound markets. They are an efficient entry to long term moves with high profit potential and can be traded on any timeframe and on any instrument in exactly the same way. The best set-ups occur when they reject technical levels before they typically head in the direction o f the prevailing trend. If you decide to trade pin bars exclusively and simply ditch everything else then you will be head and shoulders above the majority of people who flock to the market. Talk to any successful trader, read their autobiography or blog and they will have one thing in common – they stick to trading one or two strategies at the most. You can learn how to trade advanced pin bars in my forex training course in addition to how to managing the trade and profit targeting. Costly Pin Bar Mistakes That Are 100% Preventable Be sure you’re not falling victim to these pin bar mistakes, which are quite common and costly, but also—and here’s the good news—completely preventable. 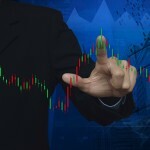 Strong Technical Signals and What They Mean to Traders We’re now seeing an influx of valid, strong technical signals, some of which haven’t been around for a little while. Here are two (2) such signals, what they mean to traders, and most of all, how to trade them.